Thin slices of fresh fall apples, coated in a beer batter and fried until golden. 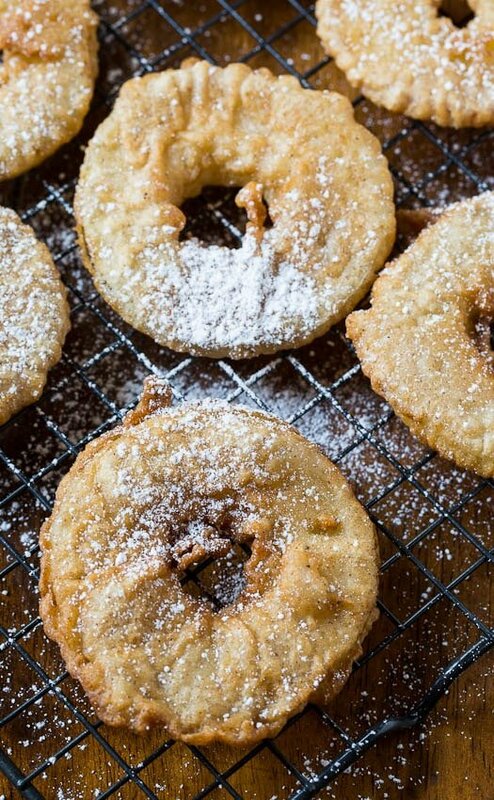 I don’t think there’s any better way to enjoy apples than Beer-Battered Apple Rings. Especially when sprinkled with cinnamon sugar. Just a few minutes in the oil makes the apples tender and delicious. Served warm they are a treat like no other. Just about anything tastes good when fried and apples are no exception. Coated in beer batter and dusted with cinnamon sugar, there is no more perfect fried food for fall. I used a combination of Gala apples and Granny Smith apples and I liked the taste of the Gala ones better. Which is no surprise because I like them better in general. I didn’t peel my apples, but it is probably preferable to do so. If the skin doesn’t soften up enough, it won’t be a easy to bite into as the rest of the apple. You want to make sure the oil is the right temperature and this is easiest done by attaching a candy thermometer to the edge of the pot. I like to do most of my frying in a Dutch oven. Heat the oil to 375 degrees. When you add the apple slices (only do about 4 at a time) the temperature will drop some which is OK. Just try not to let it go below 350. 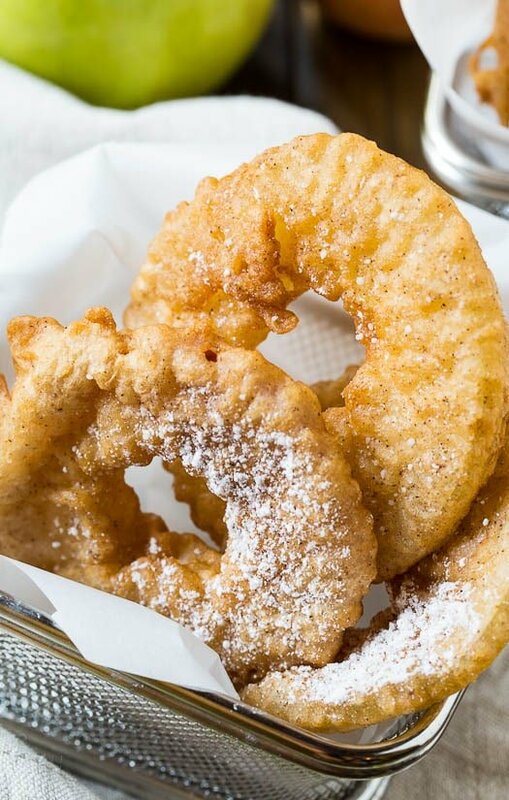 Beer-Battered Apple Rings are best eaten immediately while still warm. I think the more sugar they’re sprinkled with, the better. They would also be great dipped in some caramel sauce. Thin slices of fresh apple coated in a beer batter and fried until golden. 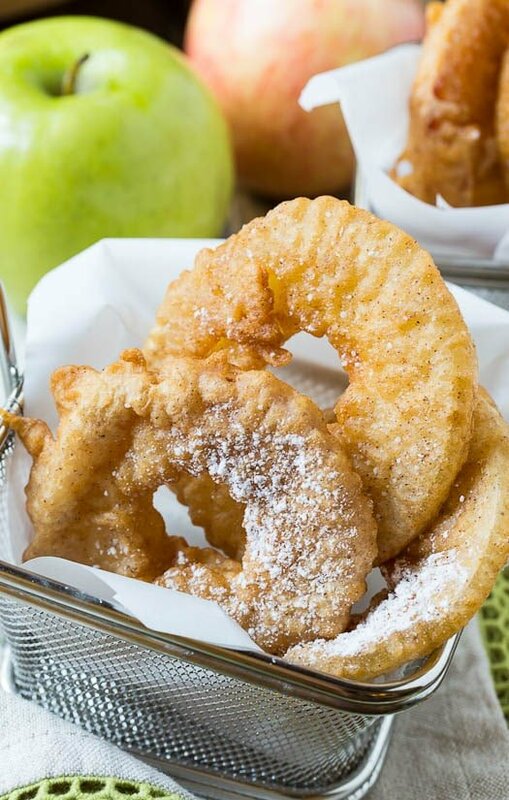 Sprinkle Beer-Battered Apple Rings with some powdered sugar for an unbelievable fall snack. In a medium bowl, whisk egg white until foamy. Whisk in beer, flour, cinnamon, nutmeg, and salt. Set aside. Pour about 2 inches of Vegetable oil into a Dutch oven or deep cast iron skillet or pot. Heat to 375 degrees. While oil is heating, cut apples into slices about 1/4 to 1/2-inch thick, starting at bottom of apple and working your way to stem end. Use an apple corer or a knife to remove the core part of each slice. Pat apple slices dry with paper towel and place in batter. Coat slices well in batter and fry about 4 apple rings at a time, cooking 2 to 3 minutes per side. Remove to a paper towel-lined plate. Immediately after removing from oil, sprinkle with just a touch of salt. 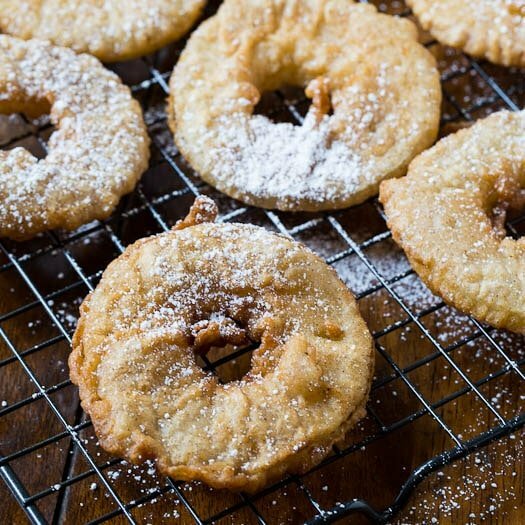 Combine powdered sugar and cinnamon and sift over apple rings before serving. Best served immediately. This entry was posted in Appetizers, Snacks and tagged apples, fried. Bookmark the permalink. Nice idea, I can also make them with cider for the rest of the family. Oh wow, do these sound good! 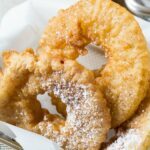 I have never seen or heard of fried apple rings but it seems like such a no brainer! A little cinnamon sugar sprinkled on top and you have the perfect fall treat! 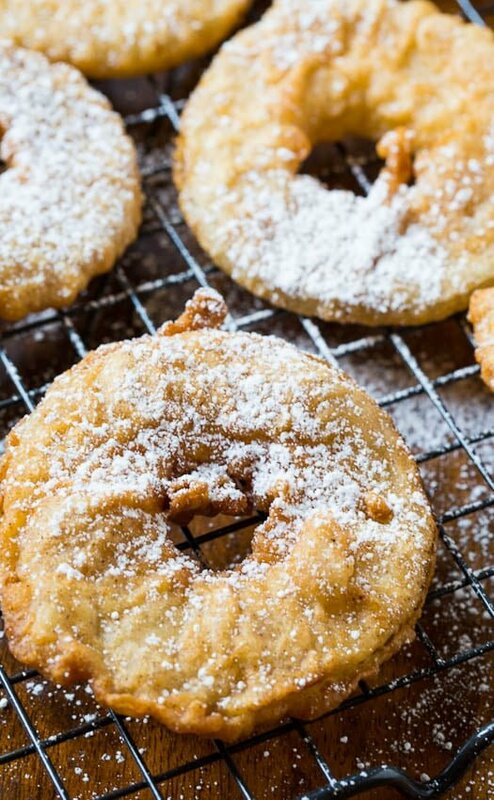 Beer battered apple rings?! I’m so impressed, Christin! My husband and I would love these! Whoa! What an awesome way to enjoy apples! Beer-battered??? That sounds amazing! I love fried apples, especially in beer batter!! They look wonderful Christin 🙂 We went to the Hendersonville NC Apple Festival last weekend and there were several street venders making these! check out my Butterscotch and Chocolate Chip Cookie Pie! Holy yum! I think it would be kinda dangerous for me to have these fried apples an arms reach away—I don’t think I would be able to share! They look so so golden and crispy and ADDICTING! Pinned! Wow, fried apples? I’ve never tried fried before but you’re so right – who could resist beer battered and fried anything? That sounds incredible! Love the powdered sugar coating too! Looks like very yummy and addictive snack!